Type: Twelve cylinders, water cooled, 60 deg. inverted vee, geared drive, four cycle. Bore and Stroke: 5.90 x 6.30 in. Displacement: 2,070 cu. in. Length and Area: 68 in x 6.2 sq. ft. Rated Output: 1,200 hp at 16,400 ft., 1,200 hp for takeoff. 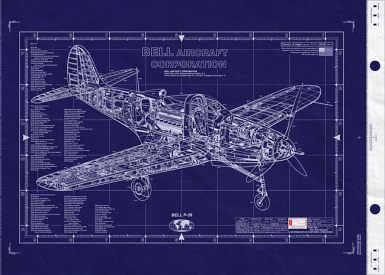 The Bell P39 Airacobra put the engine behind the cockpit in order to get it on the center of gravity and achieve maximum maneuverability. This meant driving the propeller reduction gearbox via a long tubular shaft passing between the pilot?s legs! The cannon was mounted behind the gear box and situated to fire through the propeller hub. 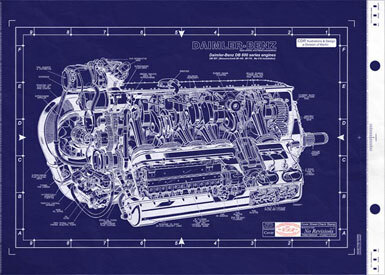 A detailed blueprint, created in the old style.